I’m a big fan of making single and group portraits of my own kiddos in a particular spot at the ABQ BioPark Zoo. I call the prop, “The Magic Throne.” It’s an over-sized cement seat, covered in a colorful, African-inspired, geometric mosaic tile design. Zoo visitors queue to sit upon the throne to be photographed in it. Sometimes these people strike selfie poses with their in-phone cameras. On this particular occasion, my daughter was frustratingly uncooperative for a decent photograph. I was irked, but the Magic Throne never disappoints. 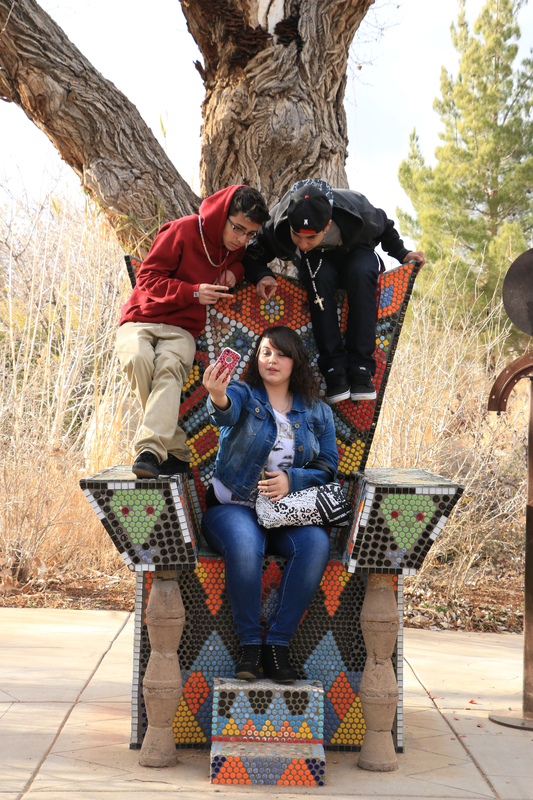 Immediately after removing her from the seat, these ‘Burque teens pounced on it. Instead of my daughter, the chair gave me this shot.